The developer that brought us the hit .io game Wings.io has just released another amazing game, Brutal.io. 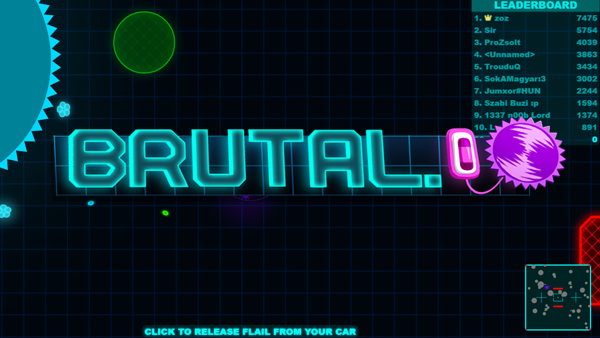 In Brutal.io you play as a car dragging around a flail. Odd right? Well, as odd as it may seem it creates some crazy fun game mechanics. The idea behind the game, like most .io games that came before it, is to kill other players and gain enough points to rank number 1 on the leaderboard. You can do this by either trying to attack players while controlling your flail by positioning your car. Or, cunningly detaching your flail at the opportune moment, by clicking your mouse, thus flinging it from its tether towards the enemy. Honestly, the latter option is my favourite. You can have a lot of fun throwing your flail around. The world is also populated with creatures that will actively try to avoid you. They can be eaten/destroyed by hitting them and killing them. This gives you points and grows the size of your flail. In this sense, the game starts to feel very similar to Agar.io, although with smoother gameplay and more in-depth game mechanics you will soon see it is a completely unique game. Albeit, very reminiscent of Zlap.io. At this point you could consider the game complete, we have a basic goal and game mechanics that allow us to have some fun while achieving those goals. Well, there is more. To make gameplay a little more captivating, the world is litter with a plethora of traps, obstacles and unique tools you can use to kill other players, or in my case, accidently run into and die. As far as the graphics are concerned, they are simple and exactly what you would expect from a .io game. They are, however, brought to life with some quirky animations and special effects. All things considered, Brutal.io feels like it has everything to grow into one of the biggest .io games, but it will need to compete with another great new .io game, Moomoo.io. Being released so closely behind Moomoo.io could easily result in Brutalio not gaining the initial publicity it deserves.